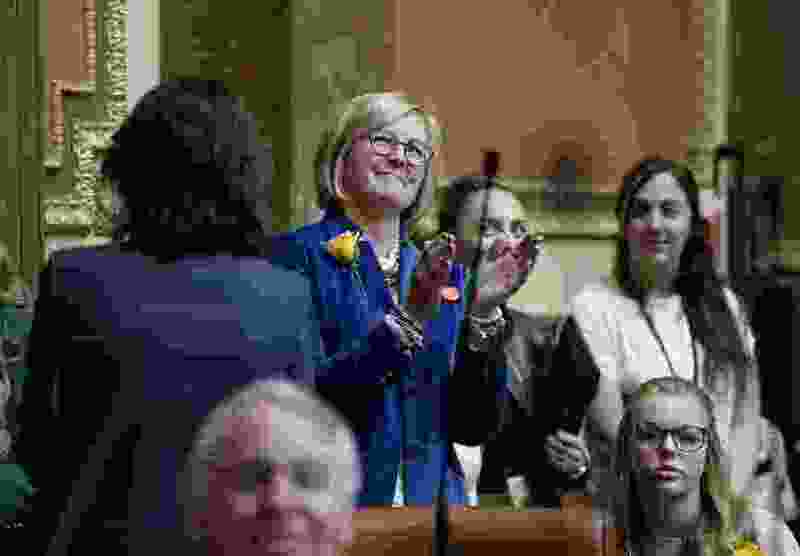 (Scott Sommerdorf | The Salt Lake Tribune) Rep. Rebecca Edwards, R-North Salt Lake, applauds after her resolution, SCR001, was passed on the House floor, Wednesday, February, 14, 2018. Edwards also sponsored HCR7, acknowledging “the impacts of a changing climate” on Utahns, which was passed favorably on Feb. 15, 2018, by the Utah Legislature’s House Committee on Natural Resources, Agriculture and Environment and signed by Gov. Gary Herbert on May 16. Ogden • A group of Utah teenagers, which had persuaded state lawmakers to adopt a resolution that recognizes the consequences of climate change and encourages the reduction of emissions, met with Republican Gov. Gary Herbert on Wednesday for a ceremonial signing of the statement. "The main message of the resolution is that economic viability and environmental stewardship aren’t different things,” Mishka Banuri, a junior at West High School in Salt Lake City, told the Standard-Examiner. The resolution, which is a formal statement and not a law, observes that the impacts of climate change affects Utah residents and calls for the use of sound science to understand the causes. It also encourages the reduction of emissions while calling for innovation to grow the economy. Piper Christian, a senior at Logan High School, said she got involved in an effort to lobby conservative lawmakers two years ago after learning about state legislation that debated climate change science. In beginning an effort for a resolution, Christian said they were told it would be a lost cause. “But as students, we believe through respectful dialogue and unwavering persistence we could convince our representatives to look past politics and come together on shared priorities in support of our resolution,” Christian said. The students gained the support of Republican Rep. Rebecca Edwards, who helped them draft the resolution last year. The resolution failed to move out of committee in 2017, but Edwards said she encouraged the teen to keep working. This year, the resolution had lawmakers’ support. It moved through the state Senate with all but three votes, and it moved the House with nearly 70 percent of members giving approval. Students have the power to create positive change not just in Utah but across the country, Christian said. “We are proud to lead the student movement for improving environmental policies and hope other students, both in Utah and other states, can use this resolution as a stepping-stone to keep making changes,” Christian said.